Day Three of The Rendezvous began early for the chefs participating in the Rendezvous Chefs Competition. All participants received an identical basket of produce and were set the task of preparing a main dish and dessert to be critiqued by the judging panel, comprised of internationally acclaimed chefs and industry experts. Guests enjoyed a day of activities on the beautiful waters of the Côte d’Azur, beginning with a poker run by tender organised by Yacht Club de Monaco. Six yacht tenders and a luxurious Maxi Dolphin set off in quest of various destinations around the port, stopping by some of the Principality’s most iconic locations. The final stop saw the teams head back to the Quai des Etas-Unis, where they presented their hands to a croupier from the Casino de Monte-Carlo and enjoyed refreshments on board MY Mystere. The winning team from MY 4H received a bottle of champagne and a table at famous Monaco nightspot Jimmy’z. In the evening, guests turned out in their finest whites for our famous Diamonds & White Party, hosted this year at the exclusive Cap d’Antibes Beach Hotel. For the first time in the history of the event, the Rendezvous fleet left the port for an evening cruise to this picturesque location where the Mediterranean takes centre stage. A three course meal prepared by Michelin starred chef Philippe Jégo was served on the water’s edge, offering spectacular views of the fleet anchored off Port Gallice. As night fell, guests took to the floor and danced under the stars until the early hours. The Port of Monaco graciously opened during the night to accommodate the returning fleet, giving owners the opportunity to return to Monaco in the comfort of their yachts. All guests of The Rendezvous gathered at the Yacht Club de Monaco this morning to bid each other Farewell over brunch. The winners of the various competitions were announced by Tony Harris, CEO of Boat International Media, who thanked guests and sponsors for making the 21st anniversary event such a special occasion. The final award of the prize giving was the Art de Vivre La Belle Classe Moët & Chandon presented by Yacht Club de Monaco. Established in 2005, this award pays tribute to owners who have a love of the ocean and the yachting life, show respect for etiquette and acknowledges the behaviour of their crew. La Belle Classe was presented to Salvatore & Paola Trifiro, owners of SY Zefira, who were delighted to receive the prize. 'We always enjoy ourselves in Monaco, but being here for The Rendezvous has been our best visit yet. We’ve made so many new friends and the organisation of the event has been perfect', said Mrs. Trifiro. 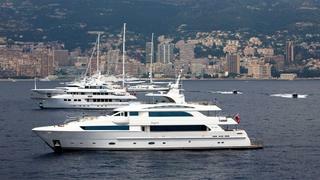 The Rendezvous in Monaco will return in June 2012, welcoming motor and sailing yachts of over 30m in length.